Full of quick tips and advice, the Brilliant series makes complex topics simple and easy to apply in the real world. 1.5 million Brilliant books have been sold around the world, so to celebrate this milestone we've included 10 Chapters from 10 of our bestselling Brilliant books to give you a taste of the series. By choosing the most inspiring and useful chapter for you, we hope you'll learn something new and get one step closer to being Brilliant on your chosen subject. 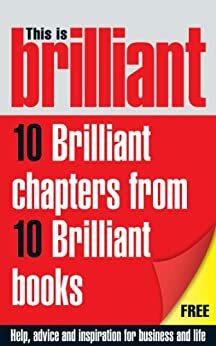 Brilliant books are available for business, careers, management, lifeskills, computing, teaching, and study skills topics. So if you need help, advice or inspiration then we have something for all your personal and professional needs. This is just a marketing ploy to get you to buy their books. Yes the content gives you a chance to read their books (they could just use Amazons View me feature though). However the book title implies that this is 10 brilliant chapters from 10 brilliant books (implying that this is samples from books the author deems to be brilliant aka great. Nope the book series they are all pulled from is called Brilliant Books. 4.0 颗星，最多 5 颗星Try before you buy! An excellent collection of book samples put together in one book. This book gives you the opportunity to check out the style of advice from different writers, sometimes really good advice can be packaged in a way that not everyone can follow. There are a range of brilliant chapters presented in this publication offering the reader the opportunity to follow up on a subject they are interested in.